Select the device and tap "Confirm"
Input the WiFi password to your device and then tap "Confirm"
In order to provide the highest customer service and assure quality of product. If you have ANY REASON that you are unhappy or unsatisfied with our product, we guarantee you a replacement within 2 years! 【Easy to Install】Set up your smart plug with 2.4Ghz wi-fi network, No Hub required, plug it into an outlet, connect a device(Android or IOS) to the smart plug. This smart WiFi plug is only support with 2.4Ghz Wifi. 【Smart Remote Control】Get rid of the limitation of space. Works with Amazon Alexa, echo dot and Google home. You can control devices from anywhere. Turn on/off with mobile or tablet using the Smart Life App by your voice. 【Safe and Energy Saving】With the remote control and timer function through network, the smart plug can protect home appliances, prevent from overcharging and overheating, make sure device powered off when not in use, and reduce energy use. 【Share with Family and Group】Share the smart plug to all family or group created in a second. People don't have to set up the smart plug on their device again. 【Timer Switch and Set Schedules】Get rid of the limitation of time. Set on/off schedules on your smart phone as needed. 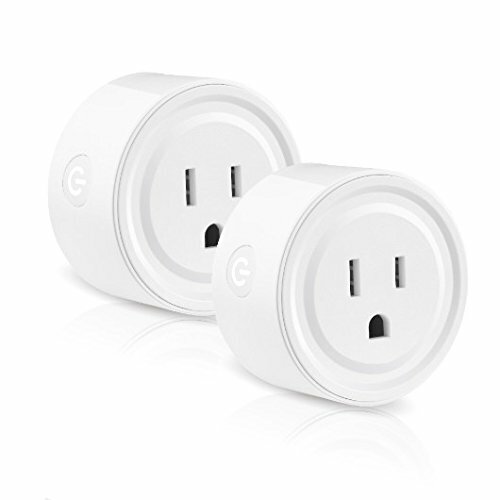 With this smart outlet, repeat ON/OFF cycle daily to automatically power electronics to save energy. If you have any questions about this product by EZH, contact us by completing and submitting the form below. If you are looking for a specif part number, please include it with your message.